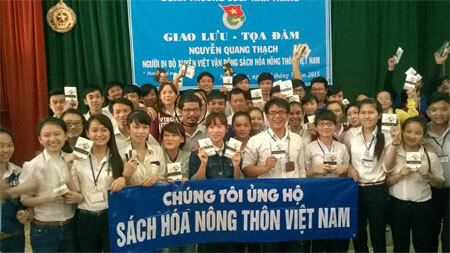 Bevy of bookworms: Nguyen Quang Thach (sixth from left) at an exchange with students. Known as the Education Knight, he believes in Vietnamese solutions to Vietnamese problems. A 40-year-old Ha Tinh man has devoted his life to providing books - and bookcases - to rural families throughout the nation. Trung Hieu reports. On the first day of the Lunar New Year, instead of spending time with his family, Nguyen Quang Thach began a trip down through Viet Nam to promote what he quaintly calls the Bookisation Prog-ramme for Rural Areas of Viet Nam. Thach, 40, born in the central province of Ha Tinh, has devoted his whole heart and "craze" to bring books to more than 10 million rural students. It was the second time he had done this since he left in the Lunar New Year of 2010. During that trip by motorcycle, Thach introduced several library models to many places along the way. This time, he decided to walk. Family members and friends were worried, but Thach assured them that he was healthy enough. Leaving Ha Noi, he walked alone along Highway 1. For a while, on his journey, some who had known of Thach's mission, asked to walk along with him for short distances. From February 19 to June 26, 2015, Thach completed the trip from Ha Noi to HCM City, passing 1,750km to boost his programme. Thach said the trip had created a tremendous impact. "More than 150 people phoned me and asked me to guide them on establishing a clan (many families of the same surname) library or a library for their schools," he said. After the trip, he and his supporters proposed to the Ministry of Education and Training that the ministry expand his model of asking parents to help set up bookcases in classrooms and other solutions to develop a reading culture nationally. The ministry also made very significant changes to boost the reading culture in society, especially in schools with multi-form approaches, he said. When I visited the house that Thach rented in Taây Ho District of Ha Noi, his room was small, but full of books. While he was busily dividing the books into small bundles, he told me excitedly, "This book was donated by the publishing house A, that book donated by the publishers B, other books donated by writers, poets, or by other individuals." 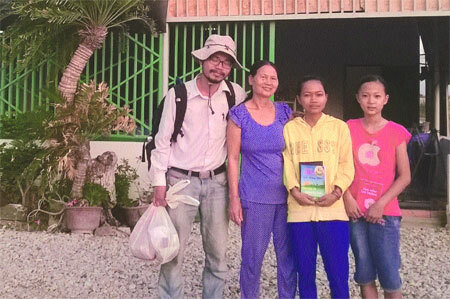 On the road: Thach (left) arrives to present books to a family in Binh Thuan Province. All the books would then be sorted and sent to the bookcases that he has helped set up throughout the country. Thach talked passionately about the support and encouragement he received from many people, who were aware that he had founded the model of "clan library" in 2007. Later, every year, he bought books and asked for books from donors, set up bookcases and transported them to donate to families in different localities. "I felt such pleasure when people received my bookcases. Here and there, in Quang Tri, Ha Tinh, Hai Duong, and Thai Binh provinces, many clans made bookcases for themselves after learning about this model," he said. Many people called him to ask how to set up a bookcase, in a very simple way. "Just think a little, spend a modest amount of money and a little time, so that people of their clan, especially children will have books to read, so they would have something to think, to open a door into the future," he said. But, to pursue and implement the plan to replicate the clan library/bookcase for many people, and then other bookcase models, Thach had to sacrifice many opportunities for himself. He graduated from Vinh University in Nghe An Province with very good English skills, and then worked for a transportation project and other international projects. He received a very good salary for a young man who just started a business. As Thach had worked on the idea of a library since his days as a student, he quit his job to follow his passion. "The reading levels of rural students were so low that they only read one or two books apart from textbooks every year, while urban students read 20 to 30 books, which was a terrible waste of the nation's humanity and innovation," Thach said. "When I arrived in a certain rural house, I saw that the only books there were the textbooks belonging to children," he said. "Then I thought of the international science discoveries, the faces of famous scientists and artists of the present day world... and there were only very few Vietnamese in that list. So I was anxious!" he said. * Spreading Vietnamese values by expanding the model to other countries. To date, with Thach's persistence and strategies, after 10 years of building theories and eight years of application, the Bookisation Prog-ramme for Rural Areas has created a civil library system based on several kinds of bookcases. These are clan bookcases, parent bookcases, where parents set up bookcases in their children's classrooms. There are also bookcases for Christian parishes where often the only books available are bibles - and others for the families of soldiers. The people, with the help of the programme, have set up more than 4,000 bookcases that help at least 250,000 rural residents, including about 120,000 students. The familiar topic that Thach often shares with others is books. "To develop popularity, intellectual and human knowledge in a sustainable way, we must use books as their base," Thach said. "We must enhance human intelligence of the Vietnamese people through books. Children have really good books to read, to learn today, so in the future we will have inventors, astronauts, and researchers at the global level," he said. That is why he chooses to be self reliant. He said he has always welcomed the help of book resources, funding for purchase of books from agencies, organisations, and individuals, but did not want to rely on foreign organisations and projects. "Because only Vietnamese can help each other become self-reliant," he said. As he is so attached to his programme, Thach has many other nicknames associated with his work such as "Thach books", "Thach clan bookcase" and "Education Knight". Many writers, scientists and urban citizens have given him books to share in the clan bookcases. More than 100,000 farmers, teachers, local government officials and others from different walks of life have joined hands with Thach to build nearly 4,000 parents bookcases. Do Hoang Son, director of the Long Minh Cultural Education Company, has donated many sets of research and craft books to the cause. He even went to Thai Binh Province to help teachers and students build innovative book models in their schools called "Science Clubs" to bring STEM (Science, Technology, Engin-eering and Mathematics) education to farmers' children. Thousands of individuals, some publishers, dozens of media agencies and governments from community to ministerial levels have helped him during his programmes and trips.